“[I]f properly understood, the dot plot can be a constructive element of comprehensive policy communication,” Federal Reserve Board Chairman Jerome Powell, March 8, 2019. Initiated to bolster the FOMC’s commitment to keep interest rates close to zero for an extended period, the SEP includes medians of economic growth, inflation and unemployment projections for the next two or three years, as well as a plot of the policy rate projections for all of the FOMC participants. “Dot plots” like the one released following the latest FOMC meeting reproduced below attract intense attention both in financial markets and in the media. Source: Federal Reserve Open Market Committee, Summary of Economic Projections, March 20, 2019. A bit like pathologists analyzing a biopsy, dotologists study these plots in an effort to divine the intentions of policymakers. When will the next interest rate move come? Will the move be an increase or decrease? How many changes are coming over the next year? What about the next two years? The questions go on and on (and on)! To the extent that the dot plot is merely a collection of forecasts, the format in which it appears would seem to limit its usefulness further. The SEP provides no means to connect the inflation, unemployment and interest rate forecasts of individual respondents. The reported medians (and ranges) do not necessarily reflect any particular FOMC participant’s view or reaction function. Moreover, the mix of individuals changes from year to year, as members enter and exit the FOMC. So, one might be skeptical about using the dots to construct a coherent story about policymakers’ likely reaction to changing circumstances. Interpreting the dot plot in this way casts light on the frequent—and potentially misleading effort—to divide policymakers into hawks and doves (see, for example, here). It is common to label those FOMC members who expect to hike rates hawks (and vice versa). But, if the goal is to anticipate future decisions, the reason why someone wants to change policy matters. Is it because, compared to the FOMC overall, a person puts a relatively higher weight on deviations of inflation from target (1+a) than on deviations of unemployment from the norm (b)? Or, is it because they have different forecasts of inflation and unemployment? From meeting to meeting, it could surely be the latter. But, absent a persistent forecasting bias, the former seems more likely to endure over time. 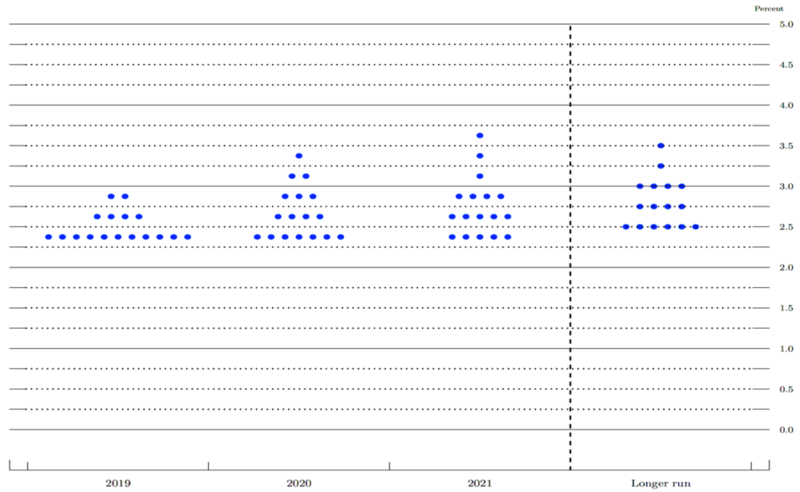 Returning to the dots, they can provide additional interesting insights into the thinking of FOMC participants. Specifically, we can estimate the Committee’s implied level of r* (the constant term in the above equation) over short intervals—say, two to three years—and (after adjusting for the 2 percent inflation target) compare them to the longer run policy rate projections reported in the SEP. The following chart shows the results of this exercise. The red line is the estimate of the short-run r* computed from the Taylor rule (we plot only the first value for each year). The shaded area depicts a 95-percent confidence interval around that measure. The black line is the median value of the long-run r* (the median projected federal funds rate in the longer run minus the 2-percent inflation objective). The dotted black lines show the range of participants’ estimates of the r* in the longer run. 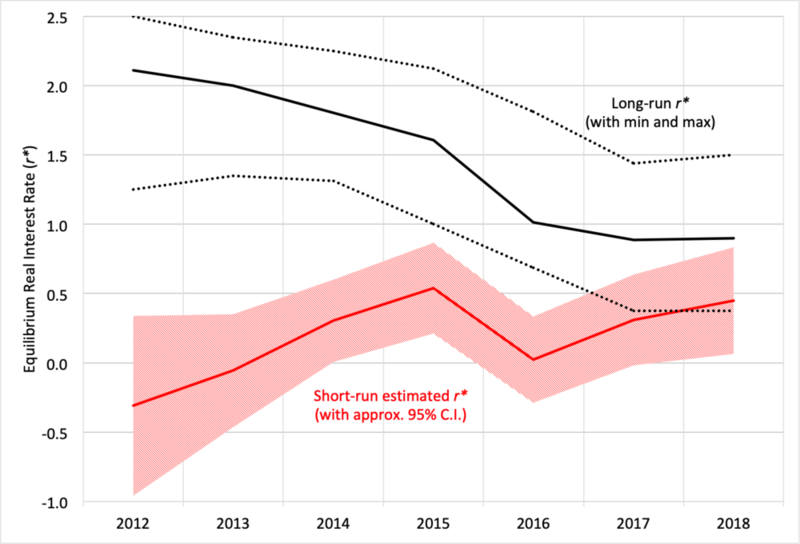 Note that the short-run r* starts well below zero in 2012, rises gradually and approaches one-half of one percent in 2018. Put differently, the FOMC’s current forecasts for interest rates, inflation and unemployment are consistent with a short-run r* of about 0.5 percent. Source: Authors’ calculations based on FOMC SEP, 2012 to 2018. The convergence between the short-run and long-run measures of r* helps us interpret Fed policy. At the start, when the short-run r* was sub-zero and far below the long-run measure, the Fed supplemented conventional interest rate policy with an array of unconventional measures, including forward guidance and large-scale asset purchases (LSAPs). The Fed halted LSAPs at the end of 2014, when the short-run r* rose above zero. At the end of 2015, the Fed began to raise interest rates for the first time since 2006. The convergence between the two measures of r* in 2017-18 coincides with the normalization of monetary policy. Our brief foray into dotology leaves us in agreement with Chairman Powell: even as currently published, the dots are quite informative. They help us to understand the FOMC’s behavior as inflation and unemployment change, and they highlight the changing perception of what is neutral. Furthermore, even over the turbulent period of the past seven years, the pattern is relatively stable. The implied levels of the short-run (and long-run) equilibrium real rate of interest evolve gradually, not abruptly, as new data prompts FOMC members to update their views. Against this background, we see little to substantiate claims of a stunning shift in FOMC strategy over the past few months. Given forecasts of inflation and unemployment, combined with estimates of equilibrium rates, the current policy rate is consistent with what a simple model based on SEP history suggests. Our conclusion is that, while there are likely to be ways to improve the SEP (see, for example, Levy), publication of the dots does more good than harm. They are a useful tool, providing information that is difficult to convey in other ways. There is no need to throw out the baby with the bathwater.